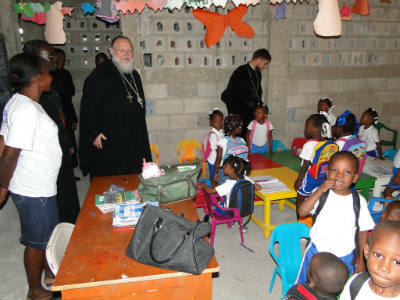 Fund for Assistance to the ROCOR - "Despite the desperate situation the country is in, our parishes in Haiti are growing and prospering,"
"OUR PARISHES IN HAITI ARE GROWING AND PROSPERING,"
Metropolitan Hilarion and Fr. Alexander Antchoutine in Haiti. 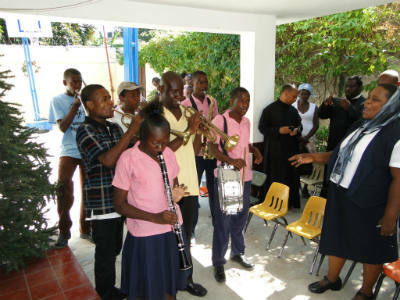 - an interview with protopriest Alexander Antchoutine after a trip to Haiti. 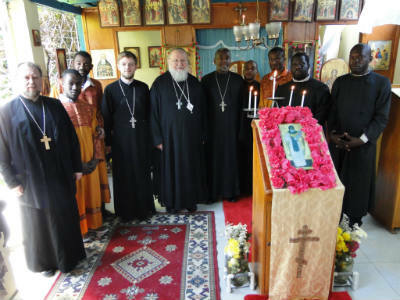 Fr.Alexander Antchoutine, rector of Holy Protection Church in Glen Cove, NY, accompanied His Emminence Metropolitan, the First Hierarch of the Russian Church Abroad on his archpastoral visit to Haiti. What he had to say after the visit is amazing. FFA: What struck you most during the trip? Fr. 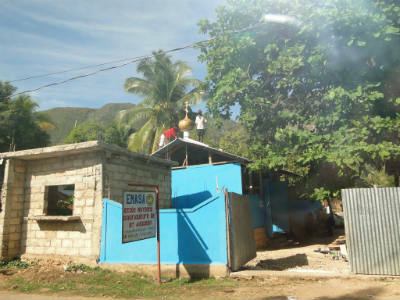 Alexander: We spent 5 days in Haiti, and visited four out of seven of our ROCOR parishes. The trip was amazing. I think that everyone should go to Haiti. People – not just our Orthodox parishioners – live in extreme poverty. Nothing is really happening in the country. I got the impression, that despite the attempts of other countries to help Haiti, in reality, there has been very little progress. Tangible assistance reaches people extremely slowly. Port-au-Prince is a huge marketplace. Locals try to make a living by buying and selling. FFA: How did the members of the mission feel about the Metropolitan's visit? Mission members were delighted that the First Heirarch paid them a visit. They warmly welcomed Vladyka and the delegation. Parishioners and their children drew large posters saying: «Welcome, Vladyko!» They hugged and kissed him. It was very touching. By the way, they were very happy that the Metropolitan served in French. It was extremely important for them that they could pray in their own language. They also said how easy it was to pray with Vladyka. Local clergy welcome the First Hierarch. FFA: How is parish life different in Haiti? Fr. 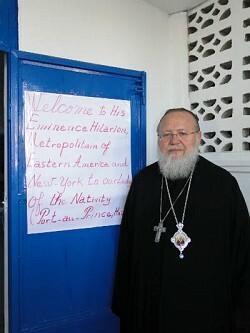 Alexander: We visited the church of the Nativity of the Theotokos in the capital – Port-au-Prince. This church, like all the other churches we saw in Haiti, does not look anything like the Orthodox churches we are used to. They are all cement or plywood walls built on a cement foundation. There are no windows or doors, just doorframes and window frames. The territory is surrounded by barbed wire. But despite the humble appearance, it is clear that the parishioners do everything to beautify their parish. From the outside the churches look strange. But when you come in, you know you are inside the House of the Lord. Nearly all churches of the mission have services nearly every day. If there is no priest available, they do a reader service. 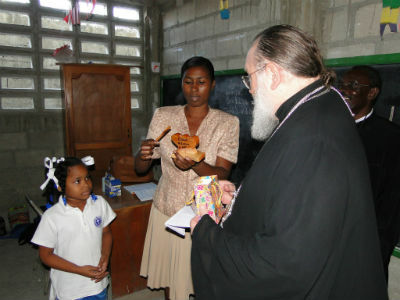 Every parish has readers – mostly thanks to FFA’s Haiti Orthodox Family Relief (HOFR) program. I’d like to thank everyone who sponsors the Haitian clergy through this program. It’s thanks to you that Orthodox spiritual life is blossoming in Haitian churches. "I’d like to thank everyone who sponsors the Haitian clergy through this program. 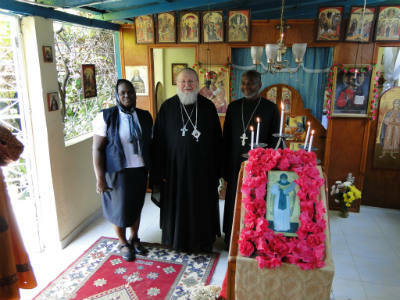 It’s thanks to you that Orthodox spiritual life is blossoming in Haitian churches." Students at the Foyer d'Amour school played in honor of the Metropolitan. Thanks to donors like you, these children are given an education, clothed, and fed. Students hug and kiss the Metropolitan. Nearly every parish has a school for kids from toddlers to 6th grade – not only for the children of the parishioners, but for anyone in need. Be they destitute, or if they don’t have parents… If it hadn’t been for these schools, some of these kids would have been living on the streets. All in all, the situation in Haiti is so terrible, that children can get an education pretty much only in a religious school – the government simply cannot give everyone an education. FFA: Does the government offer any grants or subsidies to the parishes or parish schools? Fr. Alexander: No, they do not. They survive and thrive exclusively because of God’s help, donations through the Fund for Assistance and the IOCC, and their own energy. FFA: How many students do the schools have? Fr. Alexander: The first parish school that we visited in Port-au-Prince has 300 kids. There are 10 kids per 6 square feet – they are packed like sardines. The schools don’t have windows or doors. The school provides the kids with uniforms, gives them a free education, feeds them lunch. All of this is done by the members of our mission in Haiti. FFA: Some might think that a school uniform is an unnecessary expense for a school that is struggling to make ends meet…. Fr. Alexander: The schools really have no choice. They have to give out uniforms. Many kids have lost both parents, and if they don’t have a uniform, they won’t be able to come to school, because they simply don’t have any clothes to wear. By the way, it was interesting to note, that despite the extreme poverty, everyone is dressed very nicely, cleanly, and respectably. We haven’t noticed anyone dressed provocatively. The children gave presents to their First Hierarch. FFA: Who teaches at the schools? Fr. Alexander: Mostly, it is our clergy, matushki, and locals. All of them are volunteers. I was most impressed with Fr. Gregoire Legoute's school Foyer d'Amour (Home of Love). It is a completely unique institution for mentally and physically handicapped children. 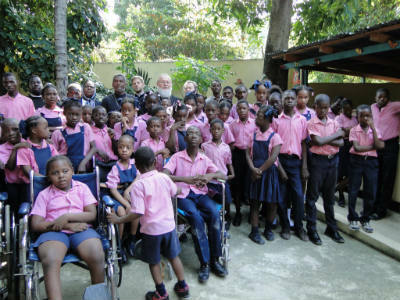 There is widespread prejudice against the handicapped in Haiti. Society as a whole is set against them. If it weren’t for Fr. Gregoire and matushka Rose, I don’t know what would have happened to these children. Most of them would likely have been thrown out into the streets. There are a total of 120 handicapped children in that school. The school provides them with an education and basic skills – drawing, sewing…. So that after graduating they would be able to provide for themselves. The mission is undertaking a truly holy work. I saw with my own eyes that our clergy in Haiti are true missionaries. They do not make money from it. They live more than humbly, but do a lot. 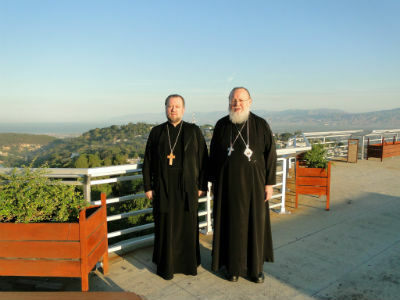 They are saving people, helping them, and not just the Orthodox. The parishes are not only providing vital assistance to the whole of Haitian society, but are also acquiring new parishioners. The churches are full on Sundays. People pray and sing with gusto and pleasure. Many of them are not even Orthodox – some are Catholic, for example. ROCOR church in Jacmel, Haiti. 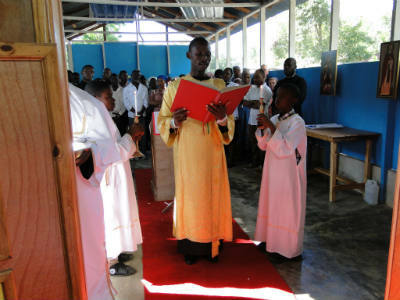 Liturgy at St. Augustine parish in Jacmel. FFA: What are the mission's most pressing needs? Fr. Alexander: All seven parishes are taken care of by three priests, three deacons and several readers. One of the mission’s most pressing needs is more clergy. There are not nearly enough priests. 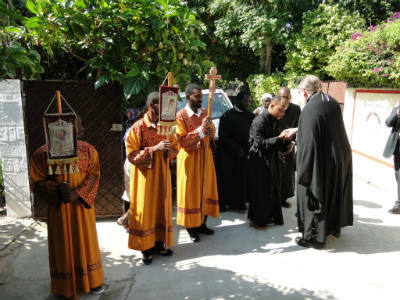 Glory to God, the St. Sergius Seminary of the Moscow Patriarchate in Paris offered several full scholarships to Haitian students. One priest, Fr. Augustine from Jacmel, is almost done with his studies and is planning on coming back to Haiti. Although they are receiving the education for free, they still need help with tickets to Paris and regular expenses. As you can imagine, it is nearly impossible to earn enough money in Haiti for even a very modest life in Paris. So the mission needs help in sponsoring the student at St. Sergius Seminary. "In general, my impression is, that despite the desperate situation in the country, our parishes in Haiti are growing and prospering. It is up to us to pray for them, to help them as much as we can, especially through the Fund for Assistance to ROCOR. Real missionary work is done in Haiti, and each of us can take part in it." Please donate now to help our brothers and sisters in Haiti! Every cent counts!